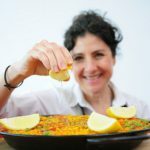 With a lifelong love of cooking inspired by happy childhood memories of helping out in the family kitchen, Madrid born Ana Lozar has launched her own Spanish food business. Ana admitted that she has a real passion for cooking borne out of spending time creating with her late mum in the kitchen. “She has been my inspiration and the real reason why I decided to set up Taparty,” shared Ana. A move from her native Spain to Lanzarote in 2003 saw Ana meet her partner Tom, originally from Cornwall, and another source of inspiration for Ana. After 9 years living in the Canary Islands and now with a family to support, Ana and her husband decided to relocate to Cornwall in April 2017. With a huge helping of enthusiasm and carefully honed culinary skills, Ana recognised that she also needed professional advice and guidance to start her business. Searching online for business start-up support in Cornwall, Ana came across the tailored and targeted advice and guidance from Outset Cornwall. Ana is keen for her business to reflect the Spanish tapas culture, which is very much a way of life in her native Spain. Taparty offers a wide selection of tapas, all distinctive of different parts of Spain, bringing to your table the most popular tapas and also those less well known but equally tasty and delicious. Passionate about sharing her delicious homemade dishes throughout Cornwall, Ana offers a private chef service, bringing a bespoke menu to enjoy in the comfort of clients’ own homes. She holds Spanish cookery classes to inspire others to create their own authentic dishes. Ana has also been bringing her brand of street food to the markets and festivals of Cornwall as well as offering paella parties to self-catering holiday cottages and wood-fired grill parties with sangria on the beach for surf clubs and hen parties. Looking to the future Ana’s vision is for Taparty to become a profitable business and to be well known for bringing to Cornwall a loyal reflection of Spanish culture. She would also love to start and Academy for Spanish Cookery in Cornwall.